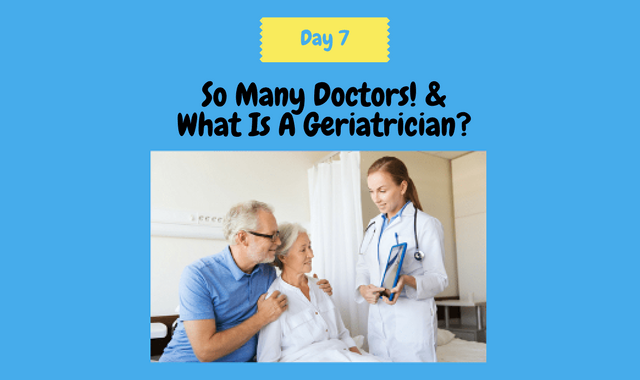 Day 7: So Many Doctors & What Is a Geriatrician? Cardiologists. Neurologists. Gastroenterologists. Ophthalmologists. Urologists As your parent ages, there is a very good chance that they have seen most if not all of these physicians. How can you help your parent manage through all these doctors and benefit most from seeing them? We’ll discuss this topic on Day 7 of the 30 Day Preparation Plan To Care For An Aging Parent. Welcome to the Raising ‘Rents Podcast. This show is sponsored by ComForCare, a national home care provider that will help you live your best life possible. Day 7 of the 30 Day Preparation Plan is the next step in preparing a plan to become a caregiver. Keep in mind as we go throughout this process that our primary goal for family caregiving, regardless of circumstances, is to provide a loved one with a comfortable, caring environment in which to grow old. Your parents may find it strange if you ask to go with them on a doctor’s visit. I mean they have handled this on their own this far. But there will be a point that you tagging along on one of these or all of these doctor visits may prove to be very beneficial in many ways. Think back to when you saw a doctor. Depending on your situation, whether it was for something that suddenly occurred like an accident or illness, there are a lot of things going on. Questions asked of you. Tests given. Potential diagnoses shared. Instructions given. It could be overwhelming. You may have had some questions prepared, thought of some during your visit, or come up with some after the visit and you try to call the doctor office back. Now picture seeing a few different doctors, for different issues, some preventative and some for acute issues, and others chronic. Not so easy to keep track of everything. Having someone with you will help. On the couple of occasions my wife went with me to the doctor, she asked a few questions I did not think of at the time. She reminded me of some of the things the doctor said that I either forgot or did not hear. Write down questions—come up with the most important ones and make sure your parents or you ask them in the limited time they have with the doctor. Write down details about what you are going to see them about—when did it start, when does it get worse, things you are doing when it occurs, times during the day or after any specific meals. Take a medication record with you. Make sure it includes vitamins and supplements. If you do not have a record, bring your everything with you. Being as respectful as possible, keeping the communication open, try to encourage your parent to have someone go with them that they are comfortable with. At the very least, drive with them, wait for them in the waiting room, speak with the nurse, or even with the doctor if they will allow it. During the visit, it is always good to have a good relationship with the provider. Being honest, asking questions, answering questions, trying their recommendations, and letting them know your comfort level, fears, and concerns will do much to help your doctors help the patient. So, what are some questions we should ask the doctor? I pulled some examples from a blog called “Today’s Caregiver” at caregiver.com. The link is in our show notes that you can find on our website www.raisingrents.com or here on Today’s Caregiver blog. There is also another trend growing—going to a geriatrician. Geriatrics as you can imagine is a fast-growing medical field. A geriatrician specializes in caring for older adults who may have serious or multiple health concerns. As doctors, they go through the same training as internists and family medicine physicians. They also undergo additional training that equips them to assess, diagnose and treat problems specific to the older populations. They may also be better equipped to know how aging adults react to illness from their experiences. They may be in better positions to address falls and the challenges with polypharmacy. It may be a challenge to convince your parent to go see a geriatrician. They will say nothing is wrong with their regular doctor and they do not need to add another one. Though they may be right about their regular doctor, the advantages of going to a geriatrician may be worth trying. For example, a geriatrician will coordinate the care across all the doctors and can be the one stop shop for many of their issues. They will also have access to many valuable resources that are specific to the aging adult. And they may have a better bedside manner because of their sensitivity from working with the older population. Certainly, worth the consideration. A good read is that might help decide if a geriatrician is a good choice for your parent is “When Do You Need a Geriatrician?”, Eldercare Online Founder and Community Coordinator Rich O’Boyle. Some of the factors he identifies where a geriatrician may come in handy are when your parent is suffering from considerable impairment and/or coping with multiple diseases, disabilities, and cognitive decline; or their medication management is getting more and more difficult; or if the family caregivers are feeling increasing strain and stress in their roles. Some final thoughts on your parents seeing doctors. Keep in mind sometimes they will not be as forthcoming about falls they had or their fear of falling. The doctor, regardless whether it is their regular doctor or a geriatrician, can be very helpful in talking about fall prevention techniques and make them aware of the risks. They will talk about polypharmacy and the risks of not managing their medication properly, side effects to look out for, they will also talk about vision and hearing and screen them on a routine basis, and proper nutrition to minimize bone loss which causes falls, such as the right amounts of calcium and vitamin D. They will pick up on any ambulation issues and recommend assistive devices such as a walker or a cane. Routine visits to the doctor will help and coordination of efforts across all providers by one primary doctor, like a geriatrician, will help your parent and help you as a caregiver significantly. So that’s Day 7. Join us for Day 8 as we talk about eye sight and our aging parents. Thank you for listening to the Raising ‘Rents podcast. This was Episode 7. If you have any questions or feedback, please go to our website www.raisingrents.com and click on the “Contact” tab. You can also find the show notes and references to anything we talked about. Until we talk again, remember that our parents raised us, the least we can do is help raise them. Talk to you later.